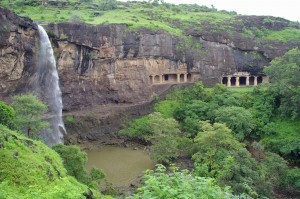 There are 24 caves at Ellora, carved between 7th & 11th century AD. These cave temples represent 3 religious faiths, carved in sickle shaped hill, spread north to south in an area of 3 km. They were dug into the slope of a hill. Of these 12 are Buddhists, 17 are Hindus and 5 are Jains. The most remarkable of the carved shrines at Ellora is the Kailasa Temple. It is 50 meters in length, 33 meters wide & 30 meters high. The fantastic edifice has been chiseled out by hand from single rock with Gateway. Pavillion, Courtyard, Assembly Hall, Vestibule, Sanctum and Tower-hall those out of the same enormous rock are also famous sites to visit. Air: Nearest ailrport Aurangabad is 30 km from Ellora. Rail: Nearest railhead Aurangabad is 30 km from Ellora. Road: Bus services are available from Aurangabad. This entry was posted in Ellora, Maharashtra and tagged ajanta and ellora, ajanta ellora, ellora caves. Bookmark the permalink.